Now what could be cooler that getting Victory Points for using Symbiotic Fungus together with Decomposers? Using it to help genetically designed bacteria produce greenhouse gases to raise the global temperature instead – of course! Science project indeed! Through a series of artificially designed reactions, these microbes can turn carbonates and other minerals into molecules that are very efficient at absorbing infrared light, thus preserving the global heat from escaping into space and instead allowing it to accumulate even more. 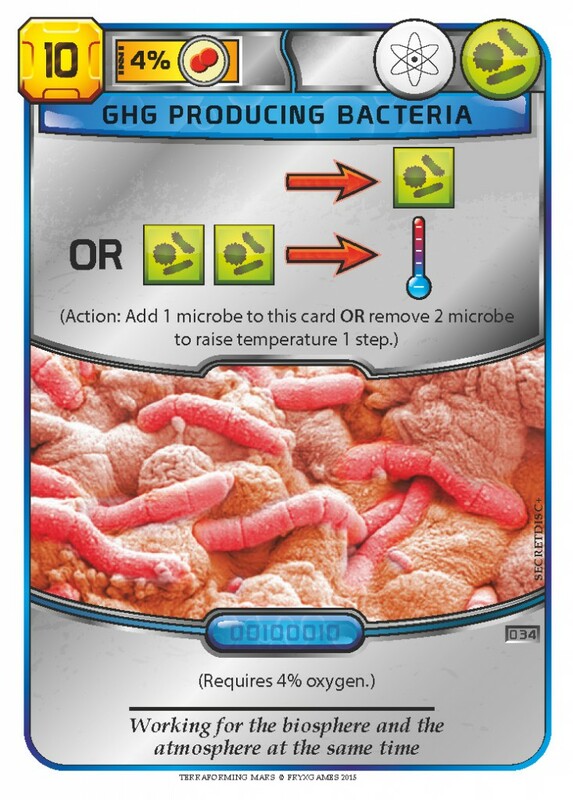 For2 generations, you’ll accumulate microbe resources on the card, and in the 3rd generation you may exchange them for a rise in temperature. This will cause the Terraforming Committee on Earth to raise your terraform rating, thus raising their regular payments as well as being worth another VP at the end of the game. And with the Symbiotic Fungus at work it will be much faster. Bring it on! I say. Now it’s time for another card and this time it’s… mushrooms! Again. Last time we promised you a card that would work together with Decomposers. Believe it or not – Symbiotic Fungus can work symbiotically with Decomposers, not only adding 1 microbe on Decomposers when played, but also adding 1 each generation as an action! Wow! Won’t you look at that! 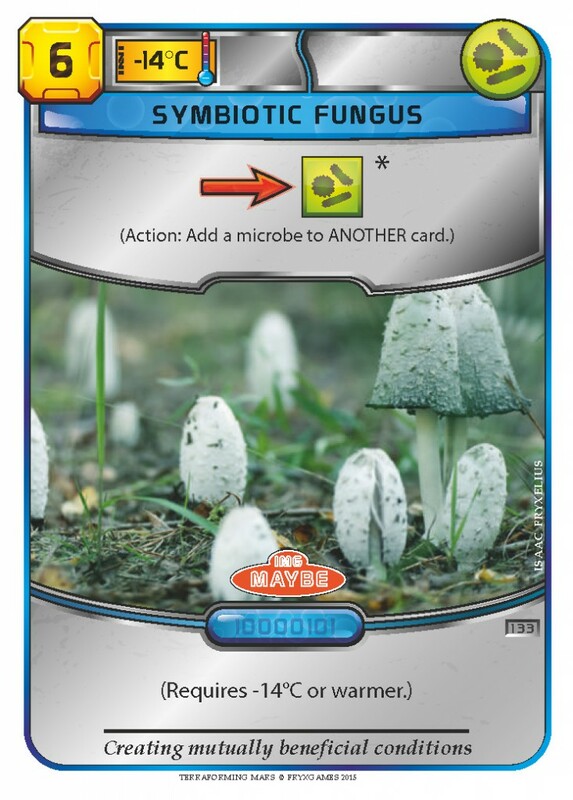 Now you don’t actually need to play any bio cards to get decomposers – you just wait for them to accumulate with the help of the helpful Symbiotic Fungus. You first have to wait until it’s warm enough for them to thrive though. It’s been a long time now, a very busy time! As we are finalising much of the layout, we can now release more cards and let you see more of the game. Decomposers are bacteria and fungi that feed on dead organisms and excrete nutrients in forms available to other organisms. This is of course very valuable from a biological perspective, awarding you VP’s. 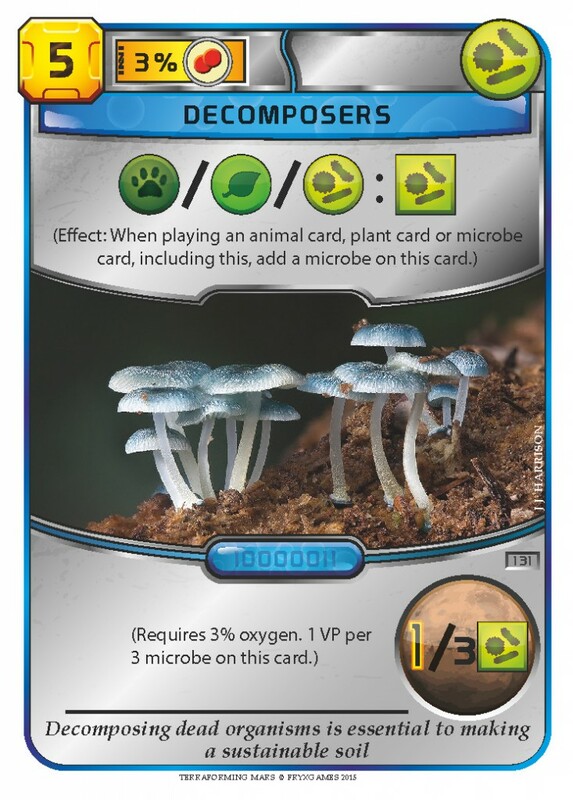 Decomposers need oxygen, though, leading to an oxygen requirement on this card, and to multiply, they also need a diversity of other organisms to feed on, giving you 1 VP for every third resource you get on it. This can be a good card to play if you hold several bio projects on your hand that you want to play later, because you will not get any bonus for the ones already played. And not from your opponent’s projects either. Next time we will see another card and how it interacts with Decomposers. And as a recompense for the long wait, the next update will be already this weekend! 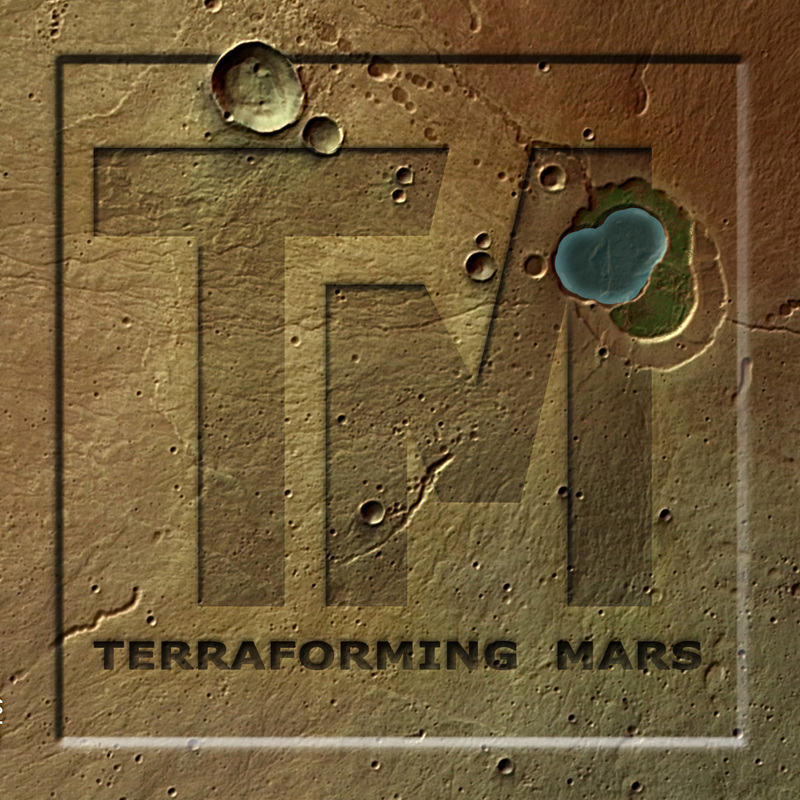 Last week, we released a sample of the new graphics for Terraforming Mars. 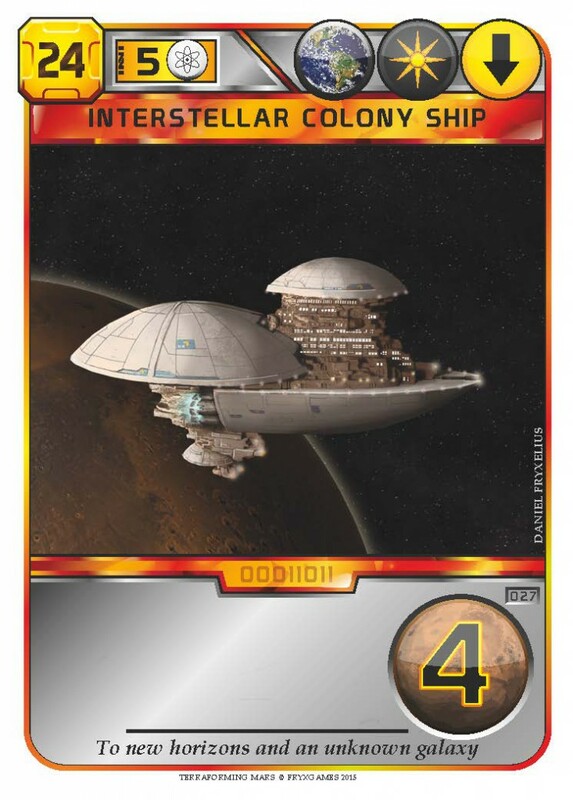 For those of you who are unaware of what Terraforming Mars is, we thought we would give you a small introduction to the theme, and to the anatomy of a card. Terraforming Mars is a resource management game where several giant corporations (players) compete for Victory Points by making Mars habitable. It is a crossover between science and science fiction, where all aspects are inspired by actual projects discussed by NASA, ESA, Mars Society, Mars One, and science fiction authors. At the start of the game, Mars is a cold, dry planet with minimal atmosphere. This is about to change, as the players introduce plant life (photosynthesis, increasing the oxygen levels), crash comets on the the martian surface (generating lots of heat and accumulating water), as well as numerous other more or less crazy projects to make Earth… eh… I mean Mars, a better place. Lightning Harvest – By sending floating supercondensers connected by wires up into the clouds, electrical discharges can be collected and utilized for energy production. This enhances your energy infrastructure, as indicated by the purple power tag (top right). In order to research this project, you must first pay 3 MC to buy the card into your hand (this is the same for all cards). Then you need to acquire at least 3 science projects before you can play Lightning Harvest (3 white science tags in the yellow requirement box). When you play it by paying 8 MC, you increase your production of energy and MCs by 1 step each. This will give you 1 additional energy and MC at the end of each turn for the remainder of the game! If the symbols had not been on the brown production box, you’d have recieved a one-time bonus only. 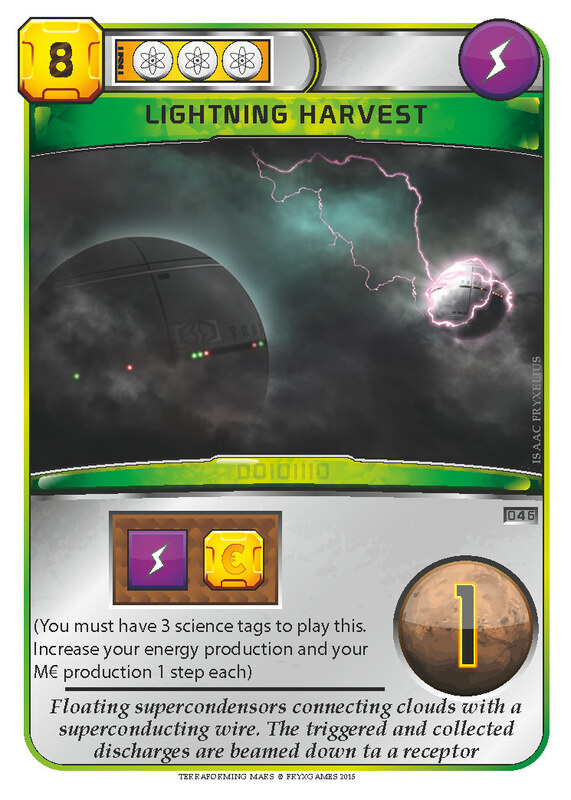 Because Lightning Harvest is an environmentally friendly technology, it is also worth 1 VP at the end of the game, as indicated by the Mars globe (bottom right). Each card in Terraforming Mars has helpful text in paranthesis explaining how the card works. Each card also has a flavor text, giving you a clue to what this project is about. There is also a stamped card number, but who cares? Because the card has a green banner, it stays on table after being played (it is still running) and its tags can be used in combination with certain other cards. We continue to work on the graphics for Terraforming Mars. Our brother Isaac has come up with a new layout for the cards, and we just can’t keep it to ourselves. Here is a sample, Interstellar Colony Ship. Does it look familiar? Long before the Pleiades were colonized, standard colony ships were exploring the systems closer to Earth. These ships were manufactured about the same time as Mars was terraformed. At this point they were merely colonization vessels. Later, some of them were converted into warships (of course, you need to buy our game Fleets and open it to know what we mean 🙂 ). Have a great week! For the first time we have a world-wide beta-testing project. 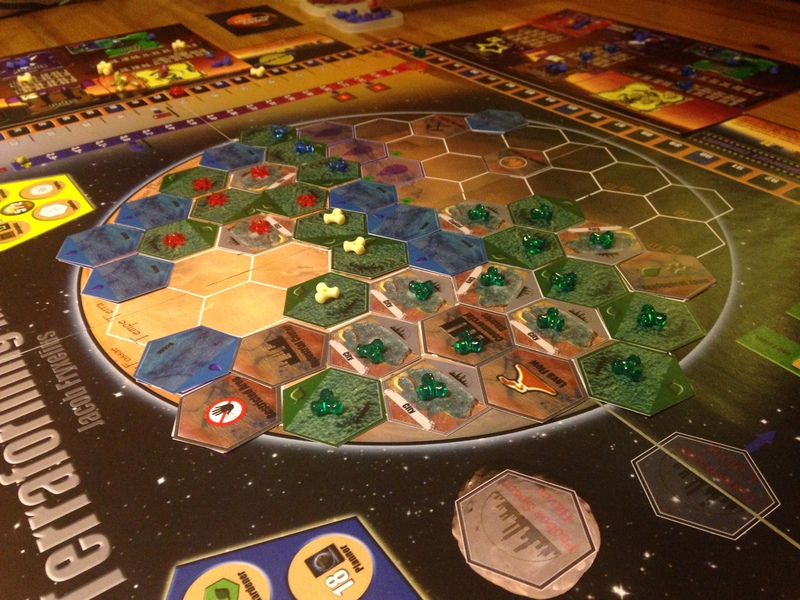 A dozen play-testing groups are currently helping us develop Terraforming Mars, which we hope to release next year. It is exciting to hear the opinions and suggestions that the groups give us. At the same time, the graphics of the game are improving as our brother Isaac sets his mind to it. The new look of the cards will be brighter, cleaner and awesome:er! Putting the play-testing to the quantative level brings out lots of special cases which we have never encountered before. This is an example, 5 cities around a commercial district is a view not usually seen. 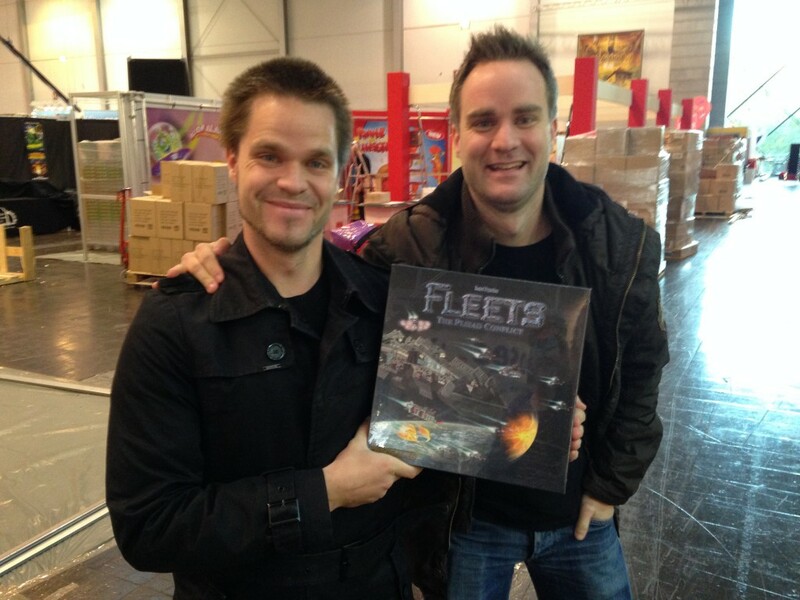 Since all four of us brothers in the company live in different cities in Sweden, meeting up for a long one-week trip to Essen is one of the absolute highlights of our year. For the third year in a row, our brother Thomas joined us, so there were five of us. 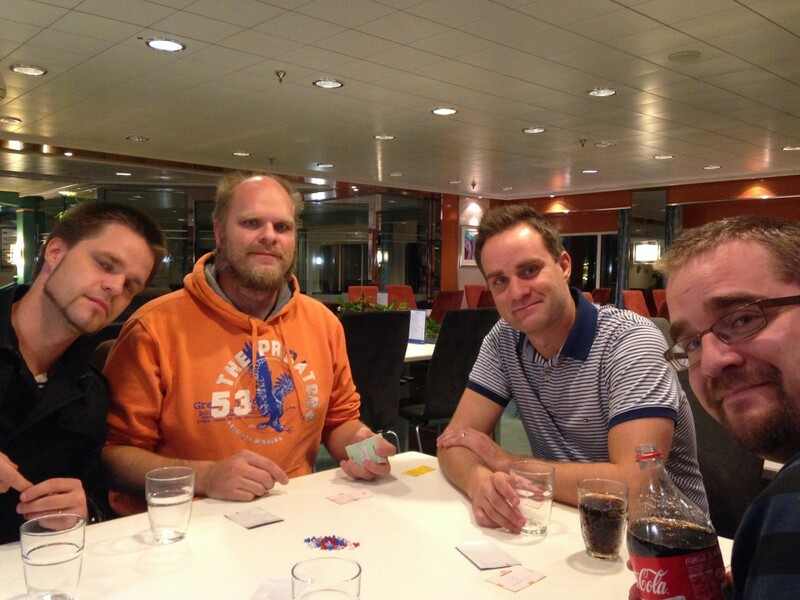 On the ferry over to Germany, we got a chance to try each others’ new prototype games and discuss future development. 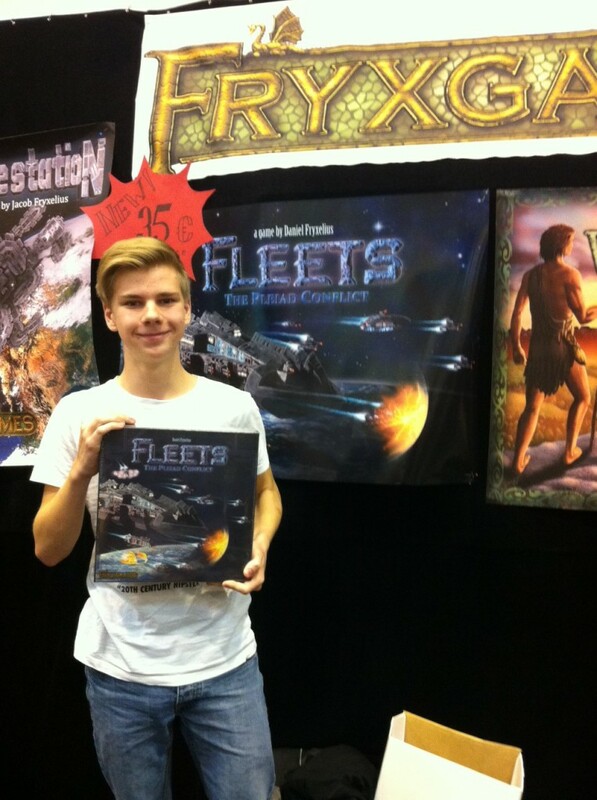 On Wednesday, we finally received the printed copies of our new game Fleets – The Pleiad Conflict, this year’s novelty. It was actually finished from the factory on Monday, and was thus one of the newest games at the fair. The other event was an announcement: Our next game will be Terraforming Mars, a resource management game about making Mars habitable for mankind. We will soon release more information about this grand project. An interesting part of our event was to release 10 prototypes of the game to official beta-tester groups chosen among the visitors at the event. Now the game is being play-tested in several countries all over the world to help us reach board game perfection for our planned release next year. All in all, Essen has been a splendid fair for FryxGames, and we would like to thank all of you who visited us during the fair, giving us great encouragement and inspiration. Thanks also to our wonderful families who have been supporting us all year long.